The internet has come a long way since its beginnings as government-funded research for military purposes. Today, people go online to read the news, do research, connect with others, and find entertaining content. More recent developments have also allowed users to enjoy services like shopping, banking, hotel booking, ticketing, music, video streaming, and much more. It has become so prevalent that it now allows smart devices to connect with each other, giving birth to the smart home (or a smart environment). With the IoT (Internet-of-Things), you can now enjoy all the benefits that connectivity brings without the need to be there physically. Few of us could ever imagine living today without the internet, but believe it or not, there are still countries where only a handful of the population is connected. Surprisingly, the global internet penetration rate is only at 53%, which means that only half of the entire population has access to the internet despite its prominence. In densely populated countries like China and India, internet penetration doesn’t even go beyond 50% of their national population (half for China at 720 million and 34% or 426 million for India), despite tech infrastructure for internet access being readily available. The silver lining is that there is room for progress in many regions, especially emerging markets, albeit it comes with challenges. For instance, Africa has so far experienced a whopping 9,942% growth in internet penetration between 2000 and 2017, while the Middle East grew 64.5% and South America 71.8%this 2018. An emerging market is a country that is close to becoming a developed nation as defined by different socio-economic factors. These places can attain advanced economy status through liquidity in local debt, equity markets, a form of market exchange and regulatory body, financial infrastructures like banks and stock exchange, and a unified currency. Multiple institutions study and determine if a country can be a part of an emerging market, such as the International Monetary Fund and Morgan Stanley Capital International. However, standard lists of emerging markets include Brazil, Chile, China, Colombia, Hungary, Indonesia, India, Malaysia, Mexico, Peru, Philippines, Poland, Russia, South Africa, Thailand, and Turkey. Around 75% of the world’s total population lives in these countries, so it’s no surprise that there is untapped potential for investors thanks to possible high returns from rapid economic growth. However, there are also dangers as some experience political instability, domestic infrastructure problems, currency volatility, and limited equity opportunities that may contribute to failure. 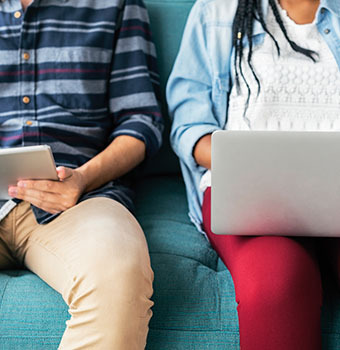 Pew Research found that internet use is the highest in the wealthiest of emerging markets like Chile and Russia, where over 70% have internet access (but still falls behind internet use in the US at 87%). As expected, those that are the poorest have the lowest rates. For instance, only 8% of people in Pakistan and 11% in Bangladesh can occasionally access the internet and own a smartphone. 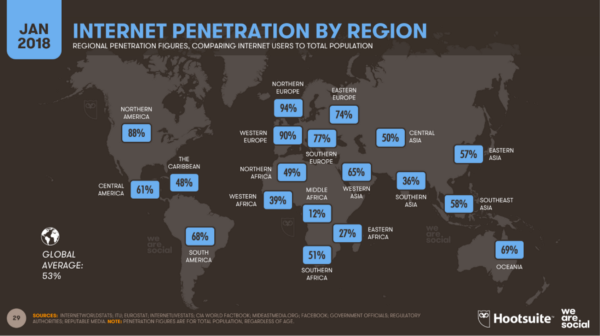 The skyrocketing of internet penetration in emerging countries can be traced to economic growth that goes hand in hand with the improvement of connectivity. Although progress is not as quick as the surge of internet use, citizens in these emerging regions have improved their quality of life through jobs and opportunities generated by digital connectivity. Consequently, salaries have increased their purchasing power and allowed them to enjoy previously unavailable services. Additionally, the increased use of smartphones and demand for gadgets has made it more of an essential than a luxury, thus making phones cheaper and more easily accessible to buyers. Stores like Micromax are selling smartphones for as low as $40 while Chinese brands Huawei and Xiaomi have become as successful as their mainstream counterparts. 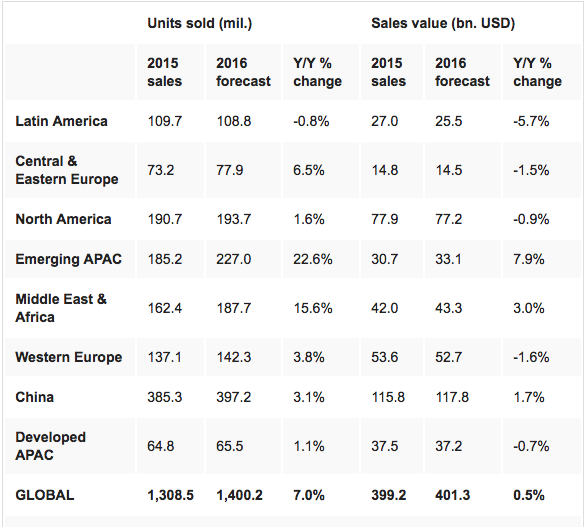 Because of these, smartphone sales in 2015 were found to grow 18% every quarter in emerging markets. Source: GfK Point of Sales (POS) Measurement data in 90+ markets for calendar year 2015and GfK forecasts for calendar year 2016, as at Jan. 2016. The same Pew Research report said that mobile internet is mostly useful for emerging markets in terms of socializing. Through social media, they get to stay in touch with family and friends. Others also go online to gather information on politics, healthcare, and government services. Another service that has become in demand and made more affordable is broadband, albeit the low price has been found proportional to its poor stability and connection. This shows that while emerging markets are ripe for the picking when it comes to better internet penetration, there are still hurdles that must be addressed. Countries such as Russia, China, and India, as well as regions like Africa, South America, and Southeast Asia, are more receptive to and trust digital technologies than advanced countries like Japan, US, and Singapore. However, this openness and trust also make them vulnerable to internet issues. Truth be told though, these are concerns that some of the advanced countries have experienced or are still experiencing. In many emerging economies, the infrastructure that supports fast connections often cannot be provided. While this may be a disadvantage, it also opens up opportunities for operators to adopt advanced technologies that can help the market’s current needs and leapfrog over legacy infrastructures. Regarding the market’s needs, it’s evident that mobile internet is the trend. Better mobile connection is the solution to the lack of fixed line broadband connectivity in emerging markets. This also means that operators can provide additional services to enhance consumer support as well as business profits. If dependence on mobile connections is expected to go up, operators must then keep their network service stable. Cell congestion will likely happen if providers fail to build sufficient network capacity, causing network outages and consumer dissatisfaction. Managing congestion will help with the customer experience and the providers’ revenue streams. An aspect where security and privacy have been a concern is in data monetization. As mentioned, emerging markets are opportunities for businesses to flourish, so it’s no surprise that the internet will be monetized, as well. Data monetization is the generation of economic benefits through available data which can be procured through business operations, exogenous data, or electronic devices. Businesses leverage it to meet their objectives, while some utilize them for social good and research. Financial services like credit card issuers and banks are good examples of corporations using data for revenue growth. Issues surrounding data monetization have added to the paranoia of information misuse. While data has been used for years to improve monetization, it is now getting attention from regulators, especially since data monetization is seen as one of the critical trends that coincide with the growth of IoT. Issues like data aggregation, reselling without compensation, and ownership will possibly plague emerging nations as more and more organizations — including telco providers — open in these locations. Personal information is usually required when signing up for services. However, when companies use these data for purposes other than what it was intended for, it may raise concerns about data privacy, too. The most notorious example of that would be the Facebook-Cambridge Analytica fiasco. Interestingly, some users are still willing to trade off personal data for digital services. A recent study found that users in emerging markets are more willing to give up their information and have companies collect and aggregate the data in exchange for online services (often for free). According to the study, 94% of users from China said they would let businesses share or reuse their personal data, while only 60% of New Zealanders would. But just like the unfortunate victims of Cambridge Analytica, the actual number of people who have shared or are currently sharing their information may be higher because they are doing it unwillingly or unknowingly. No one owns the internet, not even telecommunications companies that offer this service. The purchasing decision should depend on each person, based on the provided information from the businesses. Each user can make his or her own decision about what telco provider to subscribe to, which services or features to avail, or which websites to visit, and what information to provide these websites. Despite this, no actual rules have explicitly prevented a company from offering deals that may favor them and create an unfair competition wherein people are influenced to use only specific services. For example, in the Philippines, Globe Telecommunications offers Lifestyle Plans for postpaid users that offer unlimited calls and texts to other Globe subscribers within the same network. In 2016, Globe Telecommunications also partnered up with Niantics, creators of Pokémon Go, and offered subscribers free use of the app, without being counted against their data allocation. Additionally, Globe sponsored additional PokéStops and Gyms to enhance the gaming experience of its subscribers. Clearly, deals were made with these sites prior to Globe announcing this plan, and everyone concerned got something out of it. The downside was that other websites that were not covered by the program took a backseat. Customers were steered to a particular type of content in effect, and they less likely supported sites and companies that were not covered by the plan. A better example is Facebook offering specific services to emerging countries like India, Ghana, Kenya, and 16 others. Free Basics, a stripped-down version of different websites (including Facebook itself), is their way of connecting to poorer communities who may not have the means and resources to visit these websites, as well as to those who may want to try it out first before paying for better internet access. While it may seem like a gallant effort from the company, critics see this as Facebook and wireless companies unfairly forcing new internet users to favor only a few sites. As more telco providers open in emerging countries, the threats to net neutrality would likely be the next issue that should be tackled. There are many arguments as to why emerging nations must have better internet connections. The most compelling, though, is economic growth. Research has found that an increase of ten percentage points in internet penetration can mean an additional of 1.2 percentage points to a country’s per capita GDP, while ten percentage points of broadband penetration can add 1.38 percentage points to per capita GDP. The Boston Consulting Group also found that citizens of emerging countries are more active in using online government services compared to citizens of developed countries. They mainly use services that impact their life and livelihood such as healthcare and education. These findings prove that the internet is not only beneficial for its convenience, but also due to its capacity to improve people’s well-being, education, and earning capability. It’s all the more important now to implement solutions to internet problems, starting with its lack of penetration. Through a decentralized data marketplace and innovative framework, Open Data Exchange (ODX) sets its sights on making free internet possible for emerging economies. In the current landscape, there is technical and commercial barriers to ISPs from working with every known publishers for free internet. Only the big ones have the capacity, leaving no other options for users, thus violating net neutrality principles. ODX believes that all publishers should be given an equal chance to offer emerging markets free internet access, thus retaining net neutrality and giving more revenue to all kinds of publishers. ODX also believes that fair access to inexpensive internet is both a necessity and a fundamental human right. With stable connections, emerging markets get to enjoy opportunities for growth. For free.